One step ahead in the development process equals two steps forward in your value chain. BioReg Consultancy serves you as an important part of your value chain by contributing significantly to your business success. New medicines, especially biopharmaceuticals, follow a legally highly regulated and defined route (see insert) from research through development until they reach the patient. This route of translational medicine is covered with pitfalls and traps often unforeseen by inventors, developers and investors. The translation process of your biopharmaceutical product will be streamlined by applying knowledge, skills and experience to all parts of the translation procedure from research via GMP manufacturing, pharmacology and toxicology through clinical trials to the product approval and maintenance process. 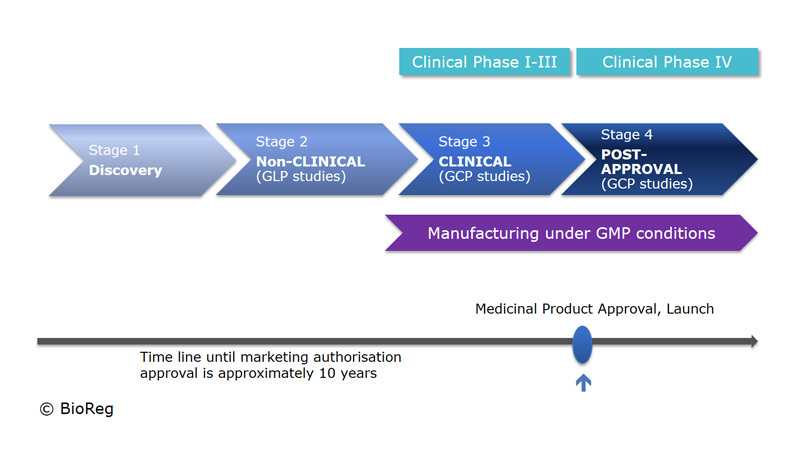 The successful licensing of new medicines is based on a sound development and registration strategy and tight project management.